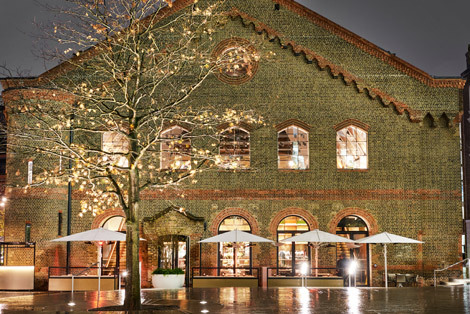 Restaurant group D&D London opened German Gymnasium in King’s Cross last month. The latest redevelopment project in an area seeing large-scale regeneration, it’s located between the entrances of St Pancras International and King’s Cross stations. Originally constructed for the German Gymnastics Society in 1865, the Grade II-listed building was the first purpose-built gym in England and a venue for the 1866 Olympian Games. 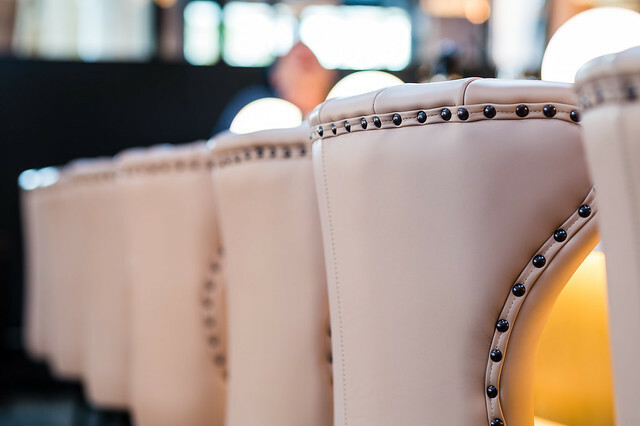 Reflecting this heritage, the newly transformed 447-cover venue comprises a grand café and restaurant serving classic Mittel-European dishes, a bar playing “Berlin beats”, plus private dining space and an outdoor terrace for warmer weather. The wine list focuses on vineyards along the Danube. D&D’s other restaurants in the capital include Le Pont de la Tour (reviewed here), Quaglino’s, Coq d’Argent, Skylon and Sauterelle (reviewed here). It also operates South Place hotel in the City, which opened in 2013 (subscribers can read a review here). Conran and Partners have done a fantastic job on the interior design, showcasing the building’s grand period features – including a wonderful wooden vaulted ceiling – while introducing a glamorous modern look. 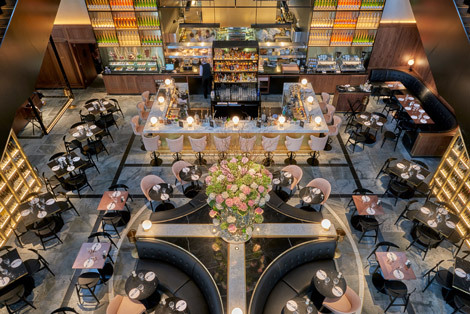 The grand café takes up the ground level of the triple-height space and features a sleek bar, an open kitchen and curved banquette seating, with a huge floral display in the centre. Staircases on either side lead up to the gallery, which houses the Meister bar and the more upscale restaurant, dimly lit with glowing lamps and candles. Tongue-in-cheek pictures of old-style gymnasts provide a nod to the building’s former life, and jaunty folk tunes play in the washrooms. We visited a couple of weeks after it opened and the place was busy on both levels. We had a cocktail upstairs first – I tried the signature Meister Collins (Monkey 47 infused lemon verbena, lemon juice and sugar, shaken and topped with homemade hops and lemongrass soda; £11.50), which was refreshing and well balanced. I would recommend trying to get a seat at the bar or by the tables overlooking the grand café rather than in the corner to the left of the bar, where we were – we were behind the kitchen service door so our view was obstructed by staff going in and out. Downstairs, the first table we were given was not too comfortable either. A table for two on the right-hand side of the room, it had quite tight aisles on either side of us and there was a lot of footfall both from staff and from customers heading for the washrooms. We asked to be moved and were given a much better banquette table on the left-hand side, which was quieter. Hearty comfort cuisine. I started with the goulash soup (£8.50), which had a decent depth of flavour, if not particularly refined, with al dente cubes of potato and a dash of sour cream. I followed that with the veal schnitzel (£25.50), which was huge, covering most of the plate, with a puffy coating. The meat was nicely tenderised and the accompanying lingonberry compote was pleasingly sweet and sour, although the warm potato salad that came with it was actually hot, it being served underneath the schnitzel, and a bit mushy. While full, I was keen to try the Black Forest gateaux for dessert. It was surprisingly light and reliably soaked in booze, and I happily polished it off. My companion had a plentiful portion of classic Caesar salad with chicken to start (£12.50), and then the GG hamburger (£15), which was correctly cooked medium, although the accompanying onion rings were overdone. His twice-baked cheesecake with blueberries (£7.50) was rather stodgy. Our waiters were friendly and attentive and everything was served promptly. A little tightening up could be done on the welcoming side – coat-taking seemed inconsistent and I had to ask for ours to be hung up after no one offered either upstairs or downstairs. There was also a bit of confusion over cocktails – in the bar we were told the German Gym and Tonic wasn’t available but downstairs it was recommended to us. Still, it was very early days when we visited so I expect such things are being ironed out. There is stiff competition in London on the European grand café scene, most notably from Corbin and King’s Wolseley, Delaunay and Fischer’s. 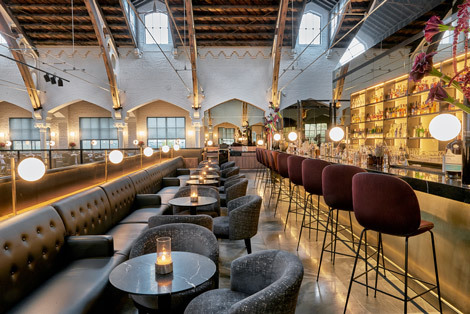 German Gymnasium offers something different from these – more hip and contemporary, it is somewhere to come for drinks as well as food, and has a great atmosphere. The food doesn’t yet match the “wow” factor of the space, but it’s off to a good start. Well placed if you are using the Eurostar, too. OPENING HOURS Grand café open 8am-11.30am, 12pm-10pm (Sat-Sun 9.30am-11am, Sun until 9pm). Restaurant 12pm-3pm, 6pm-11pm (Sun 10pm). Bar 12pm-1am (Sun-Tues 12am). PRICE Grand café starters £6-£16.50, mains £14-£35, desserts £5-£7.